Macrophages become activated initiating innate immune responses. Depending on the signals, macrophages obtain an array of activation phenotypes, described by the broad terms of M1 or M2 phenotype. The PI3K/Akt/mTOR pathway mediates signals from multiple receptors including insulin receptors, pathogen-associated molecular pattern receptors, cytokine receptors, adipokine receptors, and hormones. As a result, the Akt pathway converges inflammatory and metabolic signals to regulate macrophage responses modulating their activation phenotype. Akt is a family of three serine-threonine kinases, Akt1, Akt2, and Akt3. Generation of mice lacking individual Akt, PI3K, or mTOR isoforms and utilization of RNA interference technology have revealed that Akt signaling pathway components have distinct and isoform-specific roles in macrophage biology and inflammatory disease regulation, by controlling inflammatory cytokines, miRNAs, and functions including phagocytosis, autophagy, and cell metabolism. Herein, we review the current knowledge on the role of the Akt signaling pathway in macrophages, focusing on M1/M2 polarization and highlighting Akt isoform–specific functions. Macrophages respond to pathogens and other noxious stimuli, such as apoptotic or necroptotic cell debris, and initiate inflammatory responses. Activation of macrophages is mediated by signaling cascades downstream of TLR and cytokine receptors. Upon activation, transcriptional and epigenetic changes lead to production of proinflammatory cytokines and chemokines, migration, and elimination of the insult. At later stages of inflammation, macrophages contribute to the resolution of inflammation, and prohibit prolonged inflammatory responses that may lead to tissue injury. The diminished response following prolonged activation has been described as endotoxin tolerance when the inflammatory stimulus derives from Gram-negative bacterial LPS. The different stages of macrophage activation are broadly described as M1 and M2 polarization, both consisting of an array of states that depend on converging signals from inflammatory stimuli and the cellular environment (1). M1 and M2 status can be defined according to the activation stimulus. The M1 spectrum includes M(IFN-γ), M(LPS+IFN-γ), and M(LPS) depending on whether the signal is IFN-γ or LPS, whereas the M2 spectrum includes M(IL-4), M(Ic), M(IL-10), M(GC+TGF-β), and M(GC) when the stimulus is from IL-4, immune complexes (Ic), or glucocorticoids (GC) in combination or not with TGF-β (1). These phenotypes describe the different states of macrophages and their functions, which range from elimination of diverse pathogens to phagocytosis of apoptotic cells and tissue remodeling. Accordingly, M(IFN-γ) macrophages are associated with Th1-related pathologies where IFN-γ is abundant, and M(LPS) as well as M(LPS+IFN-γ) macrophages are found in Gram-negative bacterial infections before and after production of IFN-γ from Th1 cells. The M2 spectrum of macrophages is broader and includes macrophages that contribute to parasitic infections or other pathologies with abundant IL-4 such as asthma (2, 3), activated by immunocomplexes, termed M(Ic), such as those found in rheumatoid arthritis (4) and scleroderma (5) patients, activated by IL-10, termed M(IL-10), found in the tumor stroma or in inflamed tissues (6, 7), or induced by abundant glucocorticoids, termed M(GC), such as late stages of sepsis (8, 9) or in cancer (9, 10). Macrophage activation is a tightly regulated phenomenon, determined by several signaling cascades elicited by receptor stimulation or intracellular regulatory proteins. Many of the aforementioned activation signals use common and distinct signaling cascades, some of which are used for defining macrophage phenotype. Among the different signaling cascades, the PI3K/Akt pathway and its downstream targets have emerged as central regulators of activation phenotype in macrophages. Since the discovery of Akt 25 y ago (11) and identification of PI3K as its upstream regulator (12), the contribution of Akt in multiple cell types and functions has been widely recognized. The PI3K/Akt pathway regulates macrophage survival, migration, and proliferation but also orchestrates the response to different metabolic and inflammatory signals in macrophages (13). The PI3K/Akt pathway is activated by TLR4 and other pathogen recognition receptors, cytokine and chemokine, and Fc receptors (14–17), modulating downstream signals that control cytokine production. Activated PI3K type I phosphorylates phosphatidylinositol 4,5-bisphosphate (PIP2) to generate phosphatidylinositol 3,4,5-triphosphate (PIP3) at the plasma membrane; PIP3 further recruits Akt and the mechanistic target of rapamycin complex (mTORC) 2, and facilitates Akt activation by mTORC2 (13, 14). Activated (phosphorylated) Akt subsequently phosphorylates and inactivates the tuberous sclerosis complex (TSC) 1/2. TSC1/2 inhibition by Akt leads to mTORC1 activation, via Ras homolog enriched in brain (termed Rheb) suppression (14, 16). Activation of the PI3K/Akt pathway is critical in restricting proinflammatory and promoting anti-inflammatory responses in TLR-stimulated macrophages (18), and has been considered as a negative regulator of TLR and NF-κB signaling in macrophages (15, 16) (Fig. 1). Activation or overexpression of PI3K or Akt kinases resulted in reduced macrophage activation by LPS, whereas nonspecific chemical inhibition of PI3K signaling in TLR-activated cells augments NF-κB activation and inducible NO synthase expression (19–21) promoting M1-type macrophage responses. PI3K activation has been reported as an essential step toward M2 activation of macrophages in response to surfactant protein A or IL-4 (22, 23). A crosstalk between the STAT6 and PI3K activation is required for IL-4–induced M2 macrophage activation in SHIP-deficient macrophages (22). Akt activation is required for M2 activation, because Akt inhibition abrogates the upregulation of M2 genes (14, 24, 25). Several signals such as TGF-β, IL-10, and BMP-7 promote M2 polarization via PI3K/Akt signaling (26–28). Furthermore, induction of IL-10 in macrophages by proinflammatory signals requires activation of Akt (17, 29). Nevertheless, individual PI3K and Akt isoforms also contribute to M1 polarization (30–32). Stages of macrophage activation and the contribution of Akt signals. TLR signaling regulation by PI3K/Akt can be both direct and indirect. The PI3K/Akt1 axis has been found to upregulate IL-1 receptor–associated kinase M (IRAK-M), a suppressor of TLR4 signaling via TRAF6 inactivation (33). Activated Akt also phosphorylates and inactivates the transcription factor FOXO1 (34), resulting in suppression of its target genes that include TLR4 (35). Akt also regulates let-7e, which in turn suppresses TLR4 expression (36) and miR-146a, which suppresses the TLR signaling mediator TRAF6 (32). In most studies, the PI3K/Akt/mTOR pathway was studied as a single entity, and the effect of different isoforms of PI3K or Akt kinases was not defined. However, studies on knockout mice and studies using small interfering RNAs and chemical inhibitors provided evidence on the differential function of PI3K/Akt kinase isoforms on macrophage activation. The Akt family of serine-threonine protein kinases consists of three isoforms expressed from independent genes (Akt1/PKBα, Akt2/PKBβ and Akt3/PKBγ) (12, 37). Akts are activated by PI(3,4,5)P3 and to a lesser extent by PI(3,4)P2 that are generated by PI3K class I activation (12, 37, 38). Class IA PI3K includes three members, namely, p110α, p110β, and p110δ, which interact with an SH2 domain–containing p85 regulatory subunit (31, 39). PI3Kγ belongs to class IB PI3K with its catalytic subunit p110γ coupled with either the p101 or the p84 regulatory subunit. Among PI3K members, PI3Kδ and PI3Kγ are the predominant isoforms expressed in cells of the hematopoietic lineage (39). Whether individual Akt isoforms are activated by specific PI3K members in macrophages remains to be elucidated. Nevertheless, isoform-specific effects on macrophage function have been reported both for Akt and PI3K. Akt upstream signals in macrophage polarization: the role of PI3K isoforms, PTEN, and PDK-1. PI3K, the upstream regulator of Akt, is shown to mediate M2 macrophage phenotypes (19, 23, 40). Accordingly, induction of Arg1 activity and M2 phenotype in SHIP-deficient macrophages depends on PI3K activity, and specifically on class IA PI3K p110δ isoform (22). In addition, upregulation of miR-24 in macrophages, a negative regulator of M1 activation that promotes M2 polarization, results in reduced expression of the class IA PI3K subunit p110δ (41). Activation of PI3Κγ and PΙ3Kδ has been implicated in alveolar macrophage activation by immune complexes via Fcγ receptor (42), and is thus involved in proinflammatory signaling, whereas the anti-inflammatory effect of magnesium sulfate and naloxone are mediated by PI3Kδ and PI3Kγ kinase isoforms (43, 44). In the human monocytic cell line THP-1, the p110α PI3K subunit was required for phagocytosis, oxidative burst, and secretion of proinflammatory mediators, whereas it negatively regulated the production of TNF-α and IL-10 (45). Furthermore, macrophages deficient for PI3K p85α regulatory subunit have impaired NO and IL-12 production in response to LPS and IFN-γ stimulation, becoming vulnerable to intracellular bacterial infection (46). Despite the distinct functions of PI3K subunits, a degree of redundancy among them has been described in several aspects of macrophage activation (31, 47). The PI3K regulator lipid phosphatase, phosphatase and tensin homolog (PTEN), also contributes to macrophage polarization because deletion of PTEN results in elevated levels of Arg1 and M2 polarization (48, 49), suggesting that regulation of PI3K/Akt signaling is a central node for controlling macrophage polarization. PTEN antagonizes PI3K by converting PI(3,4,5)P3 into PI(4,5)P2, both recruiting Akt to the cell membrane (50), and loss of PTEN results in increased Akt activity accompanied by suppressed LPS responses in macrophages (19). Generation of PI(4,5)P2 augments LPS responses (51), and loss of SHIP, which converts PI(3,4,5)P3 to PI(4,5)P2, results in M2-skewing of macrophages (52). Upon recruitment to the cell membrane, Akt is phosphorylated and activated by phosphoinositide-dependent kinase 1 (PDK-1). Loss of PDK-1 in myeloid cells results in increased responses to LPS and susceptibility of mice to endotoxin shock (53). Akt downstream signals in macrophage polarization: the role of mTOR. The TSC/mTORC1 pathway, a downstream effector of PI3K/Akt, is a key sensor of nutrient status that is also activated by inflammatory stimuli, playing a role in coordination of metabolic and inflammatory signals to determine macrophage activation phenotype (14, 54). There are two complexes of the mTOR: mTORC1 (Raptor) that is negatively regulated by TSC1/2 and mTORC2 (Rictor) that phosphorylates and activates Akt (55–57). Akt promotes mTORC1 activation and activated mTORC1 mediates feedback inhibition to suppress mTORC2 and Akt activity (14, 24, 58). Current evidence on the role of TSC1/2 mTOR in the regulation of macrophage activation supports that deletion of TSC1 promotes LPS-induced proinflammatory cytokine production, M1 polarization, and suppression of IL-4–induced M2 polarization. The hypersensitivity of TSC1-deficient macrophages to LPS stimulation depends on mTORC1-induced attenuation of Akt signals. Attenuated Akt signaling results in increased inflammatory responses in TSC-deficient macrophages (14, 24, 58, 59). In contrast, another group showed that deletion of TSC1 enhances both M2 and M1 polarization (60). In an independent study in human macrophages, TSC2 deletion decreased the M1 inflammatory response in an mTOR-dependent manner (61). Using rapamycin to suppress mTORC1 has also produced contradicting results. Rapamycin treatment has been found to promote a shift to an M1-like profile, enhancing M1 and reducing M2 polarization in human and murine macrophages (61–63) and to abrogate the anti-inflammatory effects of glucocorticoids in monocytes (64, 65) via enhancing NF-κB and blocking STAT3 activity. Similar effects were shown when mTORC2 was blocked. mTORC2-deficient, bone marrow–derived macrophages showed increased M1 activation in response to LPS stimulation and higher mortality in sepsis (66, 67). A summary of the contribution of individual PI3K/Akt signaling components in M1 and M2 polarization phenotypes is provided in Table I. It remains to be investigated whether isoform-specific crosstalk between PI3K, Akt, and mTORC components dictate M1 or M2 polarization of macrophages, which may also partly explain the differences observed within previous reports. Recent studies have shown that Akt1 and Akt2 kinase isoforms hold a key role in the regulation of macrophage activation (30, 36, 68). Deletion of Akt1 promotes upregulation of inducible NO synthase and IL-12β (M1 activation) and enhanced bacteria clearance (30, 69), increased responses to LPS, and abrogation of endotoxin tolerance (30, 36). The effect of Akt1 kinase in murine macrophages has been shown to be modulated via induction of miR-155 and suppression of C/EBPβ, a transcription factor that is a master regulator of M2 differentiation (30, 36, 68, 70, 71). Induction of miR-155 in Akt1−/− macrophages sustains and amplifies M1 activation, and enhances their bactericidal capacity (72–76), partly via targeting suppressor of cytokine signaling 1 (72, 73). Akt1 deficiency and miR-155 induction in murine macrophages activate the autophagic machinery by reducing mTORC1 kinase activity and Rheb levels, two negative regulators of autophagy and key innate defense mechanisms against many invading pathogens (77–82). Akt1−/− macrophages have impaired mitophagy and reduced expression of TGF-β1, and are shown to be protective in experimental pulmonary fibrosis (83). Akt1 also mediates suppression of TLR4-induced macrophage activation by adipokines and neuropeptides. Vasoactive intestinal peptide suppresses TLR4 responses via Akt1 (84). Similarly, induction of IRAK-M and suppression of LPS responses by the adipokine adiponectin are abrogated in Akt1−/− macrophages (85). Akt2 deficiency in macrophages highlights opposing roles of Akt isoforms in macrophage polarization, because Akt2−/− macrophages possess an M2-like phenotype. Akt2−/− macrophages express elevated levels of the M2 transcription factor C/EBPβ and the M2 markers Arg1, Ym1 and Fizz1 (30). Furthermore, Akt2 deficiency in macrophages results in negative regulation of TLR4 signaling pathway via upregulation of miR-146a, an miRNA targeting IRF5, TRAF6 and IRAK1 and associated with M2 polarization (86–88). In accordance with their M2-like phenotype, Akt2-deficient macrophages express elevated levels of LPS-induced IL-10 (89). A major attribute of macrophages is active elimination of pathogens through phagocytosis. To initiate phagocytosis macrophages respond to chemokines, which induce their recruitment to the site of inflammation or tissue damage. Chemotaxis and migration precedes phagocytosis and involves signals that prime macrophages to become activated and engulf pathogens or cell debris. Chemotactic signals promote actin polymerization and formation of filopodia, facilitating movement to the site of inflammation or injury. The effect of individual Akt isoforms on migration and actin polymerization has been demonstrated in neutrophils, where, upon stimulation with chemoattractants, Akt2 but not Akt1 translocates to the membrane contributing to migration and formation of filopodia and lamellipodia. The same signals promote secretory granule release facilitating innate immune responses (90). In macrophages, absence of Akt2 results in defective CSF-1 and MCP1 signaling, impaired LIMK/cofilin phosphorylation resulting in attenuation of chemokine-induced actin polymerization and migration (91). Phagocytosis requires reorganization of actin filaments to engulf foreign bodies. Signals that initiate phagocytosis are mediated by receptors recognizing molecules that will be engulfed. CD300, a receptor that recognizes outer membrane–exposed phosphatidylserine present on apoptotic bodies, promotes F-actin polymerization via Akt activation (92). Activation of Akt appears essential for phagocytosis because suppression of Akt2 but not Akt1 or Akt3 inhibits phagocytosis of opsonized beads from macrophages (93). Different signals upstream of Akt control macrophage phagocytosis. Thus, Fc receptor–mediated phagocytosis is augmented by constitutively active Akt by activating p70S6 kinase (94). Deletion of PTEN results in enhanced Akt activity and increased Fcγ receptor–mediated phagocytosis (95). At the same time Fc receptor signals, via Akt, activate transcription of IL-10 and IL-12 (17), orchestrating responses to immune complexes. Engulfment of apoptotic cells triggers signals that activate Akt and suppress ERK1/2 pathways, and at the same time promote macrophage survival. Pathogens or cell debris are engulfed into the phagocytic bodies which are fused with lysosomes to be eliminated by autophagy, a process primarily regulated by the mTOR pathway (96). Autophagy is widely known as the process that provides an endogenous source of nutrients to secure cell survival under starvation conditions or during cell stress. The role of Akt in autophagy reveals its significance in both metabolism and survival. Thus, activation of Akt, which coincides with presence of nutrients and glycolytic metabolism, suppresses autophagy. Accordingly, M1 macrophages that have active glycolysis exhibit reduced autophagy (97). In phagocytes, the mechanisms of autophagy are used for the elimination of engulfed or intracellular pathogens. The process of elimination requires formation of active autophagosomes. Formation of autophagosomes is characterized by the processing of LC3 protein to the LC3-II type and its recruitment on their surface, termed LC3-associated phagocytosis. LC3-II induction and autophagosome formation depend on PI3K/Akt/mTOR signals. In cancer cells, activation of Akt suppresses autophagy and promotes proliferation and survival. Similarly, in Salmonella enterica infection, focal adhesion kinase is recruited on the cell membrane, activates Akt, and inhibits autophagy (98). LPS stimulation induces expression of GADD34, a sensor of nutrient depletion and DNA damage, which is involved in suppressing Akt signaling and autophagy (99). Autophagy is primarily mediated by signals that activate ULK1/2 and recruitment of Atg and LC3-II proteins on the autophagosomes. mTORC1 activation suppresses autophagy by blocking ULK1/2 and LC3-II recruitment. Thus, activation of Akt and subsequent induction of mTORC1 results in inhibition of autophagy. Signals that activate Akt result in reduced autophagy and pathogen or apoptotic body clearance. For example, in Pseudomonas-infected macrophages, annexin a2 initiates signals that result in suppression of Akt1 and mTOR-mediated induction of autophagosome formation (79, 100). Thus, activation or inhibition of Akt can modulate phagocytosis and autophagy, contributing to pathogen elimination but also to macrophage survival and inflammatory disease progression. Endotoxin tolerance is a state in which cells that have been previously exposed to Gram-negative bacterial LPS are refractory to subsequent activation. Endotoxin tolerance is transient and it protects the organism from excessive inflammation and endotoxin shock. Endotoxin tolerance is established in several disease contexts such as sepsis and trauma (101, 102) and the main cell population that mediates is macrophages (103). Endotoxin tolerance represents a state of M2-like macrophage activation, previously termed as M2c (8, 104). Thus, endotoxin-tolerant macrophages express genes that are associated with tissue repair yet have distinct features from IL-4–induced or STAT6–driven M2 macrophages because absence of IL-4Rα or STAT6 does not block endotoxin tolerance (1, 105). The Akt signaling pathway has been shown to play a significant role in the establishment of endotoxin tolerance in macrophages. Akt1 is indispensable for the establishment of endotoxin tolerance as demonstrated in mice lacking Akt1. Akt1-mediated endotoxin tolerance is mediated by suppression of miR-155 and subsequent enhancement of its target suppressor of cytokine signaling 1, and induction of let-7e followed by reduced expression of its target TLR4 (36). Endotoxin tolerance is also regulated by another miRNA, miR-146a (106, 107). Akt signaling, via Akt1, regulates expression of miR-146a and miR-155 by mediating signals that allow colocalization and silencing of one of their genomic loci, maintaining low levels of expression and suppressing induction upon a subsequent stimulus (108). G protein–coupled receptor signaling also contributes to the induction of endotoxin tolerance. Among Gai proteins the subunits Gai1 and Gai3 participate in endotoxin tolerance. Knockdown of Gai1/3 results in impaired activation of inflammatory response by LPS, and in macrophages lacking Gai1/3 Akt is not phosphorylated in response to LPS. Because Gai1/3 mediate association of Gab1 and the p85 subunit of PI3K, deletion of this subunit suppresses Akt activation and promotes M2-like polarization and tolerance to LPS (109). Whether individual PI3K or Akt isoforms are activated by Gai1/3 is not known. The p53 tumor suppressor was recently shown to be involved in M1/M2 polarization and LPS tolerance involving Akt signaling. Phosphorylation of Akt results in MDM2 activation and p53 inactivation upon M2 polarization of macrophages. Nutlin-3a on the other hand activates p53 in IL-4–treated macrophages by destabilizing the p53/MDM2 complex, which results in downregulation of M2 genes. Utilizing this mechanism, Nutlin-3a delays the establishment of tolerance to LPS both in vitro and in vivo (110). Macrophages are both positive and negative regulators of inflammatory responses possessing a pivotal role in the development of inflammatory diseases. Evidence from models of disease in rodents as well as from analysis of human specimen, support the contribution of Akt signaling in inflammatory disease development and resolution. Rheumatoid arthritis (RA) is a widely studied Th1 immune response–driven inflammatory disease in which macrophages are abundant in the inflamed synovium. Akt activity in macrophages has been associated with increased chemotaxis (111). In the mouse model of collagen-induced arthritis, increased activation of Akt1 correlates with increased migration in response to chemotactic factors, an action that can be blocked either by dominant, negative, mutant Akt1 or the PI3K inhibitor LY294002 (112, 113). In human monocyte-differentiated macrophages, the PI3K/Akt pathway is constitutively active, suggesting that it contributes to their homeostasis. Indeed, Akt mediates cell survival, and its activation in macrophages isolated from inflamed synovium of RA patients was shown to confer resistance to apoptosis through upregulation of myeloid cell leukemia sequence 1 (termed MCL1) (114). Inhibition of the PI3K/Akt1 pathway in synovial macrophages from RA patients leads to apoptotic cell death (114), supporting the value of the PI3K/Akt pathway as a therapeutic target in RA. In another model of Th1-mediated inflammatory disease, this of experimental autoimmune encephalomyelitis (EAE), the genetic deletion of Akt3 isoform results in increased CNS damage. Bone marrow transplantation experiments revealed the importance of Akt3 in both CNS (microglia) and peripheral immune cells in the development of the disease (115). In the same model, Akt activation in macrophages was associated with reduced severity of EAE and M1 markers, an activation that depended on immunity-related GTPase family member 1 (termed Irgm1), a protein expressed in M1 macrophages in early EAE (116). M1 polarization of macrophages contributes to the pathology of intestinal inflammatory diseases. In the model of dextran sodium sulfate (DSS)-induced colitis, genetic ablation of Akt1 isoform exacerbated the disease, whereas Akt2−/− mice were protected. This difference was due to the M1 phenotype of Akt1−/− and M2 phenotype of Akt2−/− macrophages. Macrophage depletion and transfer experiments showed that Akt kinases expressed in additional cell types also contribute to the pathogenesis of inflammatory bowel disease (30). In a different model of intestinal inflammation, Salmonella enterica infection, Akt2−/− mice exhibited severe inflammation in the intestine and increased bacterial load accompanied by higher mortality compared with wild-type–infected mice, which was due to defective bacterial killing (117). In noninfectious inflammatory diseases such as idiopathic pulmonary fibrosis, a condition initiated by extensive tissue damage, Akt1 is activated in alveolar macrophages and is associated with increased mitophagy and resistance to apoptosis. Alveolar macrophages require Akt1 for the production of mitochondrial reactive oxygen species and secretion of TGF-β, which promote fibrosis. Deletion of Akt1 in macrophages results in apoptotic cell death of alveolar macrophages preventing the onset of pulmonary fibrosis (83). Tumor-associated macrophages (TAMs) are present in the tumor stroma and contribute to tumor development and progression. TAMs possess an M2-like phenotype supporting tumor growth and metastasis. Efferocytosis of apoptotic tumor cells polarizes macrophages toward an M2 type via PI3K/Akt activation (118). ICAM-1 deficiency causes increased efferocytosis through Akt activation leading to increased metastasis in the liver of a mouse model of colon cancer liver metastasis (118). Among Akt isoforms, Akt2 contributes to macrophage polarization and trafficking toward tumor cells in response to CSF-1, as demonstrated in coculture experiments of siAkt2-transfected THP-1 cells and MCF7 breast cancer cells (91). Suppression of Akt2 expression in THP-1 and mouse peritoneal macrophages resulted in reduced macrophage migration (91). Akt1 regulates miR-155, which in turn appeared to be essential for antitumor macrophage responses (36). Myeloid-specific deletion of miR-155 impaired M1 activation of macrophages and reduced Akt activity leading to acceleration of tumor growth in a model of spontaneous breast cancer (119). The distinct roles of PI3K and Akt isoforms in TAMs and antitumor responses is highlighted by the fact that deletion of p110γ (p110γ−/− mice) reduces tumor growth, angiogenesis and metastasis via blockade of hypoxic stabilization of hypoxia inducible factor 1α (termed HIF1α) and decreases production of other proangiogenic factors by macrophages (120). Myeloid-specific deletion of p110γ suppresses migration of macrophages to the tumor and inhibits metastasis (121). Thus, activation of the Akt pathway can confer protumorigenic effects either by promoting M2 responses in the tumor microenvironment or by supporting inflammation (M1 phenotype). Given the opposing roles of Akt1 and Akt2 in M1 and M2 polarization, Akt isoform-–specific inhibition is imperative for modulating antitumor responses. This is supported by the fact that Akt2−/− mice bearing hepatic deletion of Akt1 develop hepatocellular carcinoma exhibiting increased infiltration of Akt1-expressing macrophages (122), potentially with an M2/TAM phenotype. 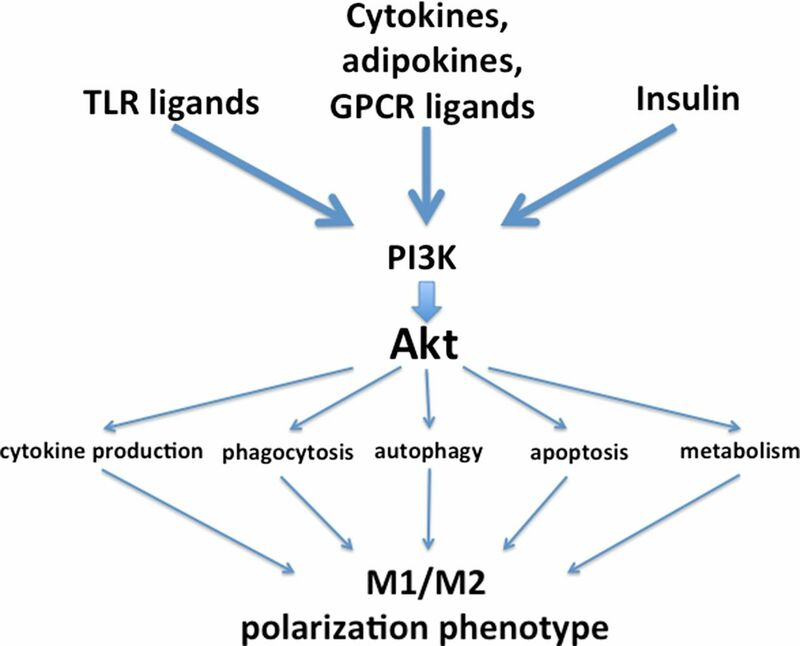 Because Akt is a major mediator of insulin signals, it has also been involved in mediating obesity and type 2 diabetes–related inflammatory diseases. The defective Akt pathway in macrophages is protective against the development of atherosclerosis. Mice bearing macrophages that lack insulin receptor and are apolipoprotein E (ApoE) deficient, have reduced Akt activity and develop smaller atherosclerotic lesions after exposure to a high cholesterol diet (123). In a different model of atherosclerosis, this of low-density lipoprotein receptor (LDLR) deficiency, transplantation of insulin receptor–deficient bone marrow cells in LDLR−/− mice showed decreased Akt activity in macrophages and enhanced formation of complex atherosclerotic lesions (124). Isoform-specific deletion of Akt in macrophages highlights their differential role in M1/M2 polarization through their contribution in atherosclerosis. Akt1 deficiency in macrophages in ApoE−/− mice resulted in severe coronary atherosclerosis and increased macrophage and endothelial cell apoptosis in atherosclerotic lesions, accompanied by increased infiltration of macrophages and secretion of proinflammatory cytokines. Transplantation of Akt1−/−ApoE−/− bone marrow to ApoE−/− mice did not increase atherosclerosis severity, indicating that macrophages lacking Akt1 are not sufficient to worsen atherogenesis and that other cells of vascular origin contribute to the severity of the disease (125, 126). Akt3−/−ApoE−/− mice developed more atherosclerotic lesions with increased macrophage infiltration, characterized by increased cholesterol accumulation and foam cell formation (127). In the LDLR−/− mouse model of atherosclerosis, Akt2 deficiency in hematopoietic cells provided protection from the development of atherosclerosis. This atheroprotective phenotype could be attributed to the M2 phenotype of Akt2−/− macrophages leading to reduced inflammation, CCR2, and subsequent reduced migration capacity (128) as well as increased cholesterol efflux, leading to decreased foam cell formation (129). 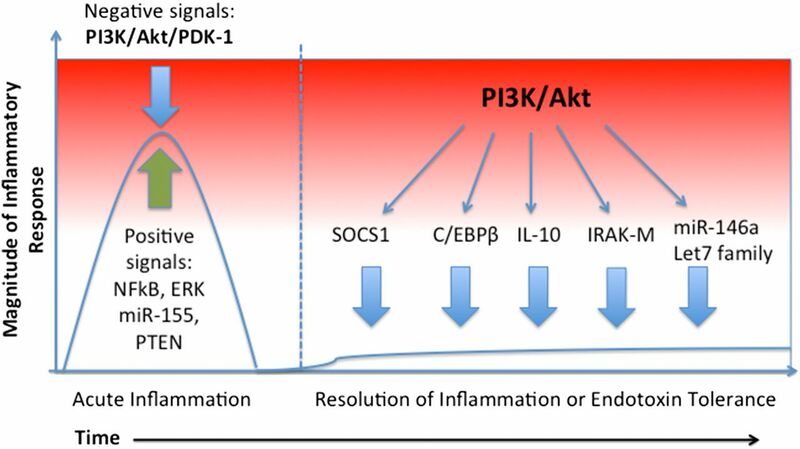 A summary of the involvement of Akt kinases in inflammatory diseases is provided in Table II. The underlying mechanisms are complex and Akt kinases are involved in inflammatory diseases not only through their role in macrophages but also in additional cell types, rendering them promising therapeutic targets. Akt signaling converges multiple extracellular and intracellular signals to regulate macrophage biology that includes production of pro- and anti-inflammatory cytokines, phagocytosis, autophagy, and homeostasis as determined by apoptosis and metabolism. Through the regulation of these functions, Akt signals determine the functional identity of macrophages, broadly characterized as M1 and M2 polarization phenotypes (Fig. 2). How Akt isoforms are regulated in macrophages and whether their expression changes upon different activation stimuli or in different subpopulations is not known. Moreover, whether PI3K/Akt isoform–specific interactions and activation of downstream effectors provide specificity for the outcome remains to be elucidated. Akt signaling converges extracellular signals to regulate macrophage biology and M1/M2 polarization. This work was supported by Greek national and European Union funds under the Aristeia Grant (2071).
. 2014. Macrophage activation and polarization: nomenclature and experimental guidelines. [Published erratum appears in 2014 Immunity 41: 339–340.] Immunity 41: 14–20.
. 2016. Alternative macrophage activation is increased in asthma. Am. J. Respir. Cell Mol. Biol. 55: 467–475.
. 2012. The biology of nematode- and IL4Rα-dependent murine macrophage polarization in vivo as defined by RNA-Seq and targeted lipidomics. Blood 120: e93–e104.
. 2014. Fc gamma receptor-TLR cross-talk elicits pro-inflammatory cytokine production by human M2 macrophages. Nat. Commun. 5: 5444.
. 2015. Oligosaccharide modification by N-acetylglucosaminyltransferase-V in macrophages are involved in pathogenesis of bleomycin-induced scleroderma. Exp. Dermatol. 24: 585–590.
. 2008. Macrophage activation and polarization. Front. Biosci. 13: 453–461.
. 2011. Dendritic cell-specific ICAM-3-grabbing nonintegrin expression on M2-polarized and tumor-associated macrophages is macrophage-CSF dependent and enhanced by tumor-derived IL-6 and IL-10. J. Immunol. 186: 2192–2200.
. 2011. Endotoxin tolerance represents a distinctive state of alternative polarization (M2) in human mononuclear cells. J. Immunol. 186: 7243–7254.
. 2015. Chronic lymphocytic leukemia: a paradigm of innate immune cross-tolerance. J. Immunol. 194: 719–727.
. 2008. Macrophage polarization in tumour progression. Semin. Cancer Biol. 18: 349–355.
. 1991. A retroviral oncogene, akt, encoding a serine-threonine kinase containing an SH2-like region. Science 254: 274–277.
. 1995. The protein kinase encoded by the Akt proto-oncogene is a target of the PDGF-activated phosphatidylinositol 3-kinase. Cell 81: 727–736.
. 2005. The activation of Akt/PKB signaling pathway and cell survival. J. Cell. Mol. Med. 9: 59–71.
. 2015. Control of macrophage metabolism and activation by mTOR and Akt signaling. Semin. Immunol. 27: 286–296.
. 2003. PI3K and negative regulation of TLR signaling. Trends Immunol. 24: 358–363.
. 2012. Toll-like receptors, signaling adapters and regulation of the pro-inflammatory response by PI3K. Cell Cycle 11: 3559–3567.
. 2007. Role of phosphatidylinositol-3 kinase in transcriptional regulation of TLR-induced IL-12 and IL-10 by Fc gamma receptor ligation in murine macrophages. J. Immunol. 179: 236–246.
. 2011. Cot/tpl2 activity is required for TLR-induced activation of the Akt p70 S6k pathway in macrophages: implications for NO synthase 2 expression. Eur. J. Immunol. 41: 1733–1741.
. 2008. Genetic analysis of the role of the PI3K-Akt pathway in lipopolysaccharide-induced cytokine and tissue factor gene expression in monocytes/macrophages. J. Immunol. 180: 4218–4226.
. 1999. Negative regulation by phosphatidylinositol 3-kinase of inducible nitric oxide synthase expression in macrophages. J. Immunol. 162: 6184–6190.
. 2009. The multiple facets of mTOR in immunity. Trends Immunol. 30: 218–226.
. 2011. Alternative activation of macrophages by IL-4 requires SHIP degradation. Eur. J. Immunol. 41: 1742–1753.
. 2005. Pulmonary surfactant protein A activates a phosphatidylinositol 3-kinase/calcium signal transduction pathway in human macrophages: participation in the up-regulation of mannose receptor activity. J. Immunol. 175: 2227–2236.
. 2013. The TSC-mTOR pathway regulates macrophage polarization. Nat. Commun. 4: 2834.
. 2012. Induction of IL-4Rα-dependent microRNAs identifies PI3K/Akt signaling as essential for IL-4-driven murine macrophage proliferation in vivo. Blood 120: 2307–2316.
. 2012. TGFβ signaling plays a critical role in promoting alternative macrophage activation. BMC Immunol. 13: 31.
. 2011. IL-10 inhibits the starvation induced autophagy in macrophages via class I phosphatidylinositol 3-kinase (PI3K) pathway. Mol. Immunol. 48: 720–727.
. 2013. SMAD-PI3K-Akt-mTOR pathway mediates BMP-7 polarization of monocytes into M2 macrophages. PLoS One 8: e84009.
. 2006. Lipopolysaccharide-induced production of interleukin-10 is promoted by the serine/threonine kinase Akt. Mol. Immunol. 43: 1557–1564.
. 2012. Akt1 and Akt2 protein kinases differentially contribute to macrophage polarization. Proc. Natl. Acad. Sci. USA 109: 9517–9522.
. 2008. The p110beta isoform of phosphoinositide 3-kinase signals downstream of G protein-coupled receptors and is functionally redundant with p110gamma. Proc. Natl. Acad. Sci. USA 105: 8292–8297.
. 2014. Akt2 deficiency protects from acute lung injury via alternative macrophage activation and miR-146a induction in mice. J. Immunol. 192: 394–406.
. 2002. IRAK-M is a negative regulator of Toll-like receptor signaling. Cell 110: 191–202.
. 2003. FOXO transcription factors as regulators of immune homeostasis: molecules to die for? J. Immunol. 171: 1623–1629.
. 2009. The kinase Akt1 controls macrophage response to lipopolysaccharide by regulating microRNAs. Immunity 31: 220–231.
. 1999. AKT/PKB and other D3 phosphoinositide-regulated kinases: kinase activation by phosphoinositide-dependent phosphorylation. Annu. Rev. Biochem. 68: 965–1014.
. 2014. Classes of phosphoinositide 3-kinases at a glance. J. Cell Sci. 127: 923–928. 2011. Phosphoinositide 3-kinase delta (PI3Kδ) in leukocyte signaling and function. Cell. Signal. 23: 603–608.
. 2002. The phosphatidylinositol 3-kinase-Akt pathway limits lipopolysaccharide activation of signaling pathways and expression of inflammatory mediators in human monocytic cells. J. Biol. Chem. 277: 32124–32132.
. 2015. miR-24 regulates macrophage polarization and plasticity. J. Clin. Cell. Immunol. DOI: 10.4172/2155-9899.1000362.
. 2008. Phosphoinositide 3-kinases gamma and delta, linkers of coordinate C5a receptor-Fcgamma receptor activation and immune complex-induced inflammation. J. Biol. Chem. 283: 33296–33303.
. 2015. Phosphoinositide 3-kinase β, phosphoinositide 3-kinase δ, and phosphoinositide 3-kinase γ mediate the anti-inflammatory effects of magnesium sulfate. J. Surg. Res. 197: 390–397.
. 2014. Anti-inflammation effects of naloxone involve phosphoinositide 3-kinase delta and gamma. J. Surg. Res. 192: 599–606.
. 2007. Monocyte p110alpha phosphatidylinositol 3-kinase regulates phagocytosis, the phagocyte oxidase, and cytokine production. J. Leukoc. Biol. 81: 1548–1561.
. 2006. Phosphoinositide 3-kinase in nitric oxide synthesis in macrophage: critical dimerization of inducible nitric-oxide synthase. J. Biol. Chem. 281: 17736–17742.
. 2012. Regulation of alveolar macrophage p40phox: hierarchy of activating kinases and their inhibition by PGE2. J. Leukoc. Biol. 92: 219–231.
. 2014. Macrophage PTEN regulates expression and secretion of arginase I modulating innate and adaptive immune responses. J. Immunol. 193: 1717–1727.
. 2016. Sustained PI3K activation exacerbates BLM-induced lung fibrosis via activation of pro-inflammatory and pro-fibrotic pathways. Sci. Rep. 6: 23034.
. 2005. Regulation of the Akt kinase by interacting proteins. Oncogene 24: 7401–7409.
. 2016. Contribution of CD14 and TLR4 to changes of the PI(4,5)P2 level in LPS-stimulated cells. J. Leukoc. Biol. 100: 1363–1373.
. 2007. The role of SHIP in macrophages. Front. Biosci. 12: 2836–2848.
. 2010. Phosphoinositide-dependent kinase 1 provides negative feedback inhibition to Toll-like receptor-mediated NF-kappaB activation in macrophages. Mol. Cell. Biol. 30: 4354–4366.
. 2015. Regulation of innate immune cell function by mTOR. Nat. Rev. Immunol. 15: 599–614.
. 2010. The tuberous sclerosis complex. Ann. N. Y. Acad. Sci. 1184: 87–105.
. 2002. Tuberous sclerosis complex-1 and -2 gene products function together to inhibit mammalian target of rapamycin (mTOR)-mediated downstream signaling. Proc. Natl. Acad. Sci. USA 99: 13571–13576.
. 2010. Activation of a metabolic gene regulatory network downstream of mTOR complex 1. Mol. Cell 39: 171–183.
. 2016. Akt-mTORC1 signaling regulates Acly to integrate metabolic input to control of macrophage activation. eLife 5: e11612.
. 2012. The role of tuberous sclerosis complex 1 in regulating innate immunity. J. Immunol. 188: 3658–3666.
. 2015. Tsc1 is a critical regulator of macrophage survival and function. Cell. Physiol. Biochem. 36: 1406–1418.
. 2008. The TSC-mTOR signaling pathway regulates the innate inflammatory response. Immunity 29: 565–577.
. 2013. Rapamycin unbalances the polarization of human macrophages to M1. Immunology 140: 179–190.
. 2006. Intracellular network of phosphatidylinositol 3-kinase, mammalian target of the rapamycin/70 kDa ribosomal S6 kinase 1, and mitogen-activated protein kinases pathways for regulating mycobacteria-induced IL-23 expression in human macrophages. Cell. Microbiol. 8: 1158–1171.
. 2011. Inhibition of mTOR blocks the anti-inflammatory effects of glucocorticoids in myeloid immune cells. Blood 117: 4273–4283.
. 2014. TSC1 controls macrophage polarization to prevent inflammatory disease. Nat. Commun. 5: 4696.
. 2014. Myeloid-specific Rictor deletion induces M1 macrophage polarization and potentiates in vivo pro-inflammatory response to lipopolysaccharide. PLoS One 9: e95432.
. 2011. Functional role of Akt in macrophage-mediated innate immunity. Front. Biosci. (Landmark Ed.) 16: 517–530.
. 2007. Intracellular bacterial growth is controlled by a kinase network around PKB/AKT1. Nature 450: 725–730.
. 2013. Akt1-mediated regulation of macrophage polarization in a murine model of Staphylococcus aureus pulmonary infection. J. Infect. Dis. 208: 528–538.
. 2013. Enhanced susceptibility to Citrobacter rodentium infection in microRNA-155-deficient mice. Infect. Immun. 81: 723–732.
. 2011. Up-regulation of microRNA-155 in macrophages contributes to increased tumor necrosis factor alpha (TNFalpha) production via increased mRNA half-life in alcoholic liver disease. J. Biol. Chem. 286: 1436–1444.
. 2012. Identifying functional microRNAs in macrophages with polarized phenotypes. J. Biol. Chem. 287: 21816–21825.
. 2012. Re-polarization of tumor-associated macrophages to pro-inflammatory M1 macrophages by microRNA-155. J. Mol. Cell Biol. 4: 341–343.
. 2013. MicroRNA-155 promotes autophagy to eliminate intracellular mycobacteria by targeting Rheb. PLoS Pathog. 9: e1003697.
. 2014. Hypoxia-induced MIR155 is a potent autophagy inducer by targeting multiple players in the MTOR pathway. Autophagy 10: 70–79.
. 2015. Annexin A2 regulates autophagy in Pseudomonas aeruginosa infection through the Akt1-mTOR-ULK1/2 signaling pathway. J. Immunol. 195: 3901–3911.
. 2013. Hepatitis C virus inhibits AKT-tuberous sclerosis complex (TSC), the mechanistic target of rapamycin (MTOR) pathway, through endoplasmic reticulum stress to induce autophagy. Autophagy 9: 175–195.
. 2015. An alpha-adrenergic agonist protects hearts by inducing Akt1-mediated autophagy. Biochem. Biophys. Res. Commun. 456: 250–256.
. 2011. Autophagy in immunity and inflammation. Nature 469: 323–335.
. 2016. Macrophage Akt1 kinase-mediated mitophagy modulates apoptosis resistance and pulmonary fibrosis. Immunity 44: 582–596.
. 2008. Vasoactive intestinal peptide suppresses toll-like receptor 4 expression in macrophages via Akt1 reducing their responsiveness to lipopolysaccharide. Mol. Immunol. 45: 2970–2980.
. 2009. Adiponectin promotes endotoxin tolerance in macrophages by inducing IRAK-M expression. J. Immunol. 182: 6444–6451.
. 2015. Functions of miR-146a and miR-222 in tumor-associated macrophages in breast cancer. Sci. Rep. 5: 18648.
. 2010. miR-146a mediates protective innate immune tolerance in the neonate intestine. Cell Host Microbe 8: 358–368.
. 2006. NF-kappaB-dependent induction of microRNA miR-146, an inhibitor targeted to signaling proteins of innate immune responses. Proc. Natl. Acad. Sci. USA 103: 12481–12486.
. 2012. Myeloid cell IL-10 production in response to leishmania involves inactivation of glycogen synthase kinase-3β downstream of phosphatidylinositol-3 kinase. J. Immunol. 188: 367–378.
. 2010. Akt isoforms differentially regulate neutrophil functions. Blood 115: 4237–4246.
. 2009. Akt2 is required for macrophage chemotaxis. Eur. J. Immunol. 39: 894–901.
. 2014. CD300b regulates the phagocytosis of apoptotic cells via phosphatidylserine recognition. Cell Death Differ. 21: 1746–1757.
. 2007. Akt2, but not Akt1 or Akt3 mediates pressure-stimulated serum-opsonized latex bead phagocytosis through activating mTOR and p70 S6 kinase. J. Cell. Biochem. 102: 353–367.
. 2004. The serine/threonine kinase Akt promotes Fc gamma receptor-mediated phagocytosis in murine macrophages through the activation of p70S6 kinase. J. Biol. Chem. 279: 54416–54425.
. 2004. The inositol 3-phosphatase PTEN negatively regulates Fc gamma receptor signaling, but supports Toll-like receptor 4 signaling in murine peritoneal macrophages. J. Immunol. 172: 4851–4857.
. 2009. The multifunctional role of mTOR in innate immunity: implications for transplant immunity. Am. J. Transplant. 9: 2655–2661.
. 2015. AKT mediated glycolytic shift regulates autophagy in classically activated macrophages. Int. J. Biochem. Cell Biol. 66: 121–133.
. 2014. Activation of focal adhesion kinase by Salmonella suppresses autophagy via an Akt/mTOR signaling pathway and promotes bacterial survival in macrophages. PLoS Pathog. 10: e1004159.
. 2015. GADD34 inhibits activation-induced apoptosis of macrophages through enhancement of autophagy. Sci. Rep. 5: 8327.
. 2008. Cholesterol-rich membrane rafts and Lyn are involved in phagocytosis during Pseudomonas aeruginosa infection. J. Immunol. 180: 2396–2408.
. 2013. Current trends in inflammatory and immunomodulatory mediators in sepsis. J. Leukoc. Biol. 93: 329–342.
. 2013. Sepsis-induced disseminated intravascular coagulation, symmetrical peripheral gangrene, and amputations. Crit. Care Med. 41: e290–e291.
. 1988. Induction of tolerance to lipopolysaccharide (LPS)-D-galactosamine lethality by pretreatment with LPS is mediated by macrophages. Infect. Immun. 56: 1352–1357.
. 2010. Macrophages, innate immunity and cancer: balance, tolerance, and diversity. Curr. Opin. Immunol. 22: 231–237.
. 2013. Dissociation of endotoxin tolerance and differentiation of alternatively activated macrophages. J. Immunol. 190: 4763–4772.
. 2014. Induction of endotoxin tolerance by pathogenic Neisseria is correlated with the inflammatory potential of lipooligosaccharides and regulated by microRNA-146a. J. Immunol. 192: 1768–1777.
. 2009. miR-146a is critical for endotoxin-induced tolerance: IMPLICATION IN INNATE IMMUNITY. J. Biol. Chem. 284: 34590–34599.
. 2015. Coordinated regulation of miR-155 and miR-146a genes during induction of endotoxin tolerance in macrophages. J. Immunol. 195: 5750–5761.
. 2015. Gαi1 and Gαi3 regulate macrophage polarization by forming a complex containing CD14 and Gab1. Proc. Natl. Acad. Sci. USA 112: 4731–4736.
. 2015. A unique role for p53 in the regulation of M2 macrophage polarization. Cell Death Differ. 22: 1081–1093. 2013. Intracellular signaling pathways in rheumatoid arthritis. J. Clin. Cell. Immunol. 4: 160.
. 2014. Ligation of TLR5 promotes myeloid cell infiltration and differentiation into mature osteoclasts in rheumatoid arthritis and experimental arthritis. J. Immunol. 193: 3902–3913.
. 2013. The novel role of IL-7 ligation to IL-7 receptor in myeloid cells of rheumatoid arthritis and collagen-induced arthritis. J. Immunol. 190: 5256–5266.
. 2012. Managing macrophages in rheumatoid arthritis by reform or removal. Curr. Rheumatol. Rep. 14: 445–454.
. 2013. Suppression of inflammatory responses during myelin oligodendrocyte glycoprotein-induced experimental autoimmune encephalomyelitis is regulated by AKT3 signaling. J. Immunol. 190: 1528–1539.
. 2016. Irgm1 is required for the inflammatory function of M1 macrophage in early experimental autoimmune encephalomyelitis. J Leukoc Biol. DOI: 10.1189/jlb.3A0116-028RR.
. 2011. Protective role of Akt2 in Salmonella enterica serovar typhimurium-induced gastroenterocolitis. Infect. Immun. 79: 2554–2566.
. 2015. ICAM-1 suppresses tumor metastasis by inhibiting macrophage M2 polarization through blockade of efferocytosis. Cell Death Dis. 6: e1780.
. 2013. A role for miR-155 in enabling tumor-infiltrating innate immune cells to mount effective antitumor responses in mice. Blood 122: 243–252.
. 2014. A macrophage-dominant PI3K isoform controls hypoxia-induced HIF1α and HIF2α stability and tumor growth, angiogenesis, and metastasis. Mol. Cancer Res. 12: 1520–1531.
. 2011. Receptor tyrosine kinases and TLR/IL1Rs unexpectedly activate myeloid cell PI3kγ, a single convergent point promoting tumor inflammation and progression. Cancer Cell 19: 715–727.
. 2016. Spontaneous hepatocellular carcinoma after the combined deletion of Akt isoforms. Cancer Cell 29: 523–535.
. 2006. Myeloid lineage cell-restricted insulin resistance protects apolipoproteinE-deficient mice against atherosclerosis. Cell Metab. 3: 247–256.
. 2006. Macrophage insulin receptor deficiency increases ER stress-induced apoptosis and necrotic core formation in advanced atherosclerotic lesions. Cell Metab. 3: 257–266.
. 2015. Akt isoforms in vascular disease. Vascul. Pharmacol. 71: 57–64.
. 2007. Loss of Akt1 leads to severe atherosclerosis and occlusive coronary artery disease. Cell Metab. 6: 446–457.
. 2012. Akt3 deficiency in macrophages promotes foam cell formation and atherosclerosis in mice. Cell Metab. 15: 861–872.
. 2014. Macrophage deficiency of Akt2 reduces atherosclerosis in Ldlr null mice. J. Lipid Res. 55: 2296–2308.
. 2015. Hematopoietic Akt2 deficiency attenuates the progression of atherosclerosis. FASEB J. 29: 597–610.